Ashley J George | AD-ventures of a Creative: A Memory . . .
A Memory . . . It was exactly 10 years ago to this minute that I heard the first plane had hit the World Trade Center. I had gotten up for another day of my senior year in high school at 6:38AM, I never got up this early for school. I turned the radio on before I got in the shower and that's when I heard. I went in to tell my mom about what I had heard. She kind of brushed it off like it must had been an freak accident. I continued to get ready like it was a normal day. Though as I got to my first period H.E.R.O. class, we all started to realize that this wasn't an accident. Every class I went to that day had the television on, we watched the second plane hit. We watched the first and then second tower collapse. The pentagon and then flight 93 crash. 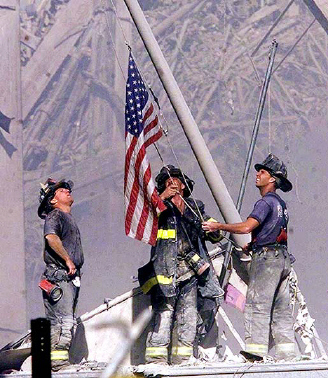 Our country changed forever that day. I don't think there is enough gratitude we could exude to everyone who was involved in helping to save this country and the people hurt in the hateful act initiated that morning. My hope for this 10th Anniversary, is that everyone spends time to reflect and remember how we came together as a country. We were a community that day, we were a unit. We were thankful for the survivors. We were doing whatever we could to find other survivors. We never gave up hope. I really think this mentality is necessary to have today. The problems with this country, the economy, the unemployment etc. are fixable. But we need to come together as a community again. We need to stop this me vs you mentality. We need to come together. We need to start supporting our neighbors and become the strong nation the rest of the world looks to us to be. We are a place where anything you dream and work for can happen.